I wanted to make a bridge out of wooden bricks, with no glue or connectors, held up by gravity only. Now, I want to build this out of wood, so we won’t actually have this curve, but a ‘blocky’ version of this. Now we have to decide how to cut the wood. 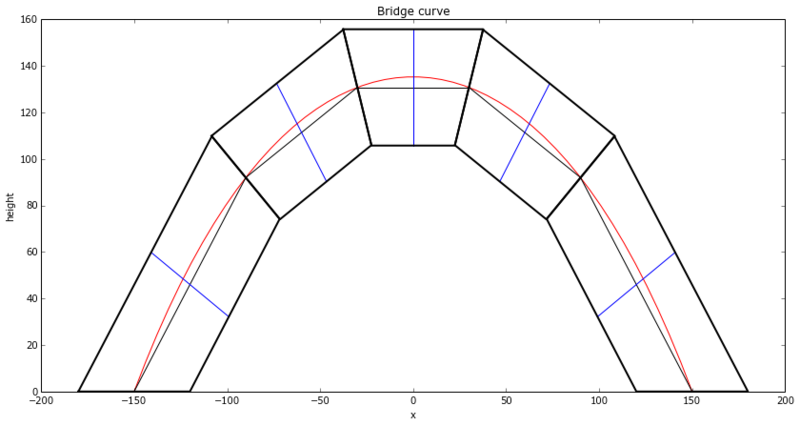 To produce the arch, the angle of each piece of wood (the tangent lines), relative to the horizontal, is just: . So the angle between two adjacent pieces of wood is the difference between their angles. Now, the red curve is going to represent the line of force. My reasoning is that if there was any force normal to the red curve, then the string/bridge/weight would thus accelerate and change position. The code appears to do some pretty redundant calculations when calculating the angles – but much of this is to make the signs of the angles correct. It’s easier and nicer to let atan2 handle the signs for the quadrants, than to try to simplify the code and handle this ourselves. The blocks aren’t actually exactly the same size at the points where they meet. The differences are on the order of 1%, and not noticeable in these drawings however. """Rotates the given polygon which consists of corners represented as (x,y), around the ORIGIN, clock-wise, theta radians"""
"""Shifts the polygon by the given amount"""